Workman Publishing Company, 9780761184492, 352pp. It’s the ACT’s turn. No longer considered a “regional” test and accepted at all four-year colleges throughout the United States, it’s the most popular college admissions test in the country. More than 1.8 million students from the class of 2013 took it. 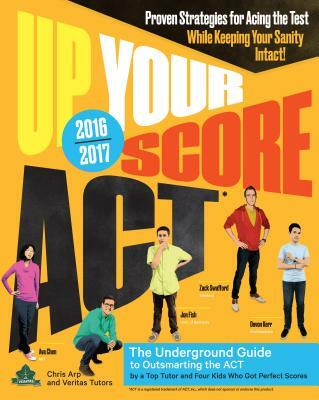 Now updated to address the changes planned for the ACT in 2015, Up Your Score: ACT is the test prep and survival guide that kids will actually want to use. Written by Chris Arp, a Princeton graduate and top ACT tutor— with the help of four students who aced the test (and went on to the colleges of their choice)—it’s a true insider’s guide, filled with effective strategies and tips, delivered with the attitude, smarts, and wit that make Up Your Score the best-selling alternative test prep series in print. Beginning in 2015, the ACT will include more layers in its scoring (including separate STEM, English language arts, and “progress toward career readiness” sub-scores); in some places it will be administered digitally (and those tests will include optional “constructed-response” questions, in which students will have to come up with the answers, not select among multiple choices); and the essay will be less open ended, requiring more analysis. In addition to addressing these changes, the book explains how to crush the reading section by developing the Five Habits of Lean Forward Reading. Master the math section through techniques like “plugging in,”?an amazing trick that simplifies all algebra word problems. Annihilate the English section by absorbing six key punctuation and eight essential grammar rules. And sail through the science section by understanding that it actually tests reasoning. Plus there is an ACT fitness regime, tongue-in-cheek fashion and beauty tips, and a recipe for energy-boosting GameFace Quintuple Sugar Blast Bars. Good luck finding that in any other test prep book. Chris Arp is a veteran and highly sought-after test-prep tutor at Veritas (now called Zinc Educational Services). He has a BA from Princeton and a masters in education from Brooklyn College and is writing a novel. Ava Chen is a graduate of MIT and is currently studying the behavior of jumping spiders at Harvard's Wyss Institute. Jon Fish graduated in three years from the University of Kentucky with a degree in history and political science. He plans to attend law school. Zack Swafford is getting a masters in artificial intelligence at Stanford.